This radionuclide bone scan is from an 88 y/o male with metastatic prostatic adenocarcinoma. 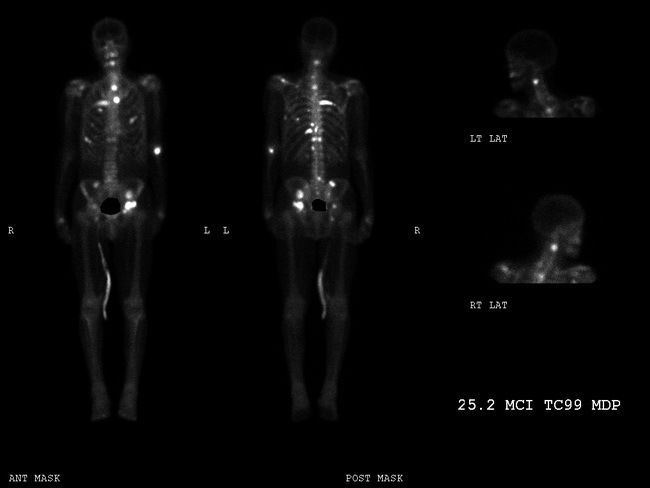 The scan shows several "hotspots" (left pelvis, cervical and thoracic spine, and ribs) which represent areas of new bone formation with increased uptake of radioisotope. The hotspot on left arm is the injection site. The elongated hotspot between thighs is the catheter with isotope excreted in urine. Bone scans are quite sensitive in detecting skeletal metastases.